They'll need to visit nearly 400 docking stations with a time per station of only about seven minutes, which sounds ambitious. Chances are several of their intended stations will be full (right). Not to mention the recent welter of reported technical glitches, which will probably see all their 400 rides being charged to my key. There's more charity-stunt-ride fun this weekend in London, when the seven-person conference bike going from John o'Groats to Land's end passes through London. 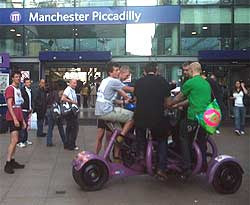 Here they are at the weekend, looking for cycle parking at Manchester Piccadilly (from MadHeadCyclist's twitpic; more photos on their Facebook album). How is this going to increase the share of cycling to 25%, as the mayor claims? About 1,140,000 people enter London during the morning peak. 25% of that is 285,000 people. How will this kind of charity event persuade them to cycle to work? How would this bike hire scheme, which can't cope with more than 500 users at a time, carry them? How is it going to contribute in any way, to improved facilities for cycling? The scheme cost over £100 million, and if all it has to show is occasional charity events, then it is clearly a waste of money. And ten to one this event is a viral marketing ploy anyway, which is being paid for out of the budget for the scheme. Yeah yeah, and the real cycling blog is also paid for by Boris, or is it the CIA? The sudden appearance of websites which encourage 'social media' or 'online-game' interest is typical of viral marketing strategies, especially if they try to hide their origins. Try asking for a detailed breakdown of the scheme's marketing budget under the Freedom of Information Act. Or try asking the organisers of this 'charity event' for their full names, a business address, a bank account number, or any trustworthy form of audit. It was registered in Utah two days ago, by Phil Jones of Real Time Consultancy. His LinkedIn profile shows he is a branding and marketing consultant, specialising in sport and leisure marketing. He is obviously a very busy man, who has no time to run that website as a hobby. So why not simply call him, and ask him who paid him to set up the site? Bugger. All this money apparently sloshing around for people doing bike-related websites, and nobody's offered me any brown envelopes yet? Pff. Anonymous - and I understand that it's all bad? I imagine that it's not boris bikes that are supposed to carry 25% of commuters - it's more like an impulse to make people aware of an alternative to a car. Check out how long it took Denmark to get to where they are. Do you think they didn't make mistakes? Sure, they started doing it right - they went away from vehicular cycling and gave people on bikes separate paths. Your conspiracy blabbing doesn't make any sense I am afraid. I know its fairly pointless trying to persuade you that I am the person actually organising this charity event, where we are intending to cycle around every docking station on a Boris Bike, but I am, and I can assure you that it is not in the slightest bit a marketing ploy by TFL or anyone else. Yes, I am looking to publicise the charity I am raising money for, Frank Water Projects, who genuinely do save thousands of lives every year, but that is it. If we happen to publicise the cycle scheme, then that is an added bonus - the scheme is a fantastic scheme. I was actually surprised to come across these fairly negative comments, which admittedly were more negative about the scheme itself than the charity ride. Most people seem to be embracing the scheme, and talking very highly about it. 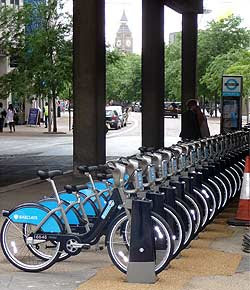 Just have a look at borisbikes.co.uk and check out how many 'Love Bikes' posts there are vs. 'Hate Bikes'. Its a shame that for once, when a fantastic scheme like this has been launched, and someone genuinely is doing the good thing, that people are so sceptical about it all!! As for the 'anonymous' person asking whether the organisers would be able to provide full names, bank account details and an audit, I would gladly get in touch with you directly and explain what we are doing. What's more, the fact the donations are going straight on to justgiving means that the charity benefits straight away. I have raised thousands of pounds in the past for larger more established charities, including Cancer Research, and I wonder whether you would be as doubtful or suspicious if that was the charity that I was raising money for. As for 'hiding my origins', I probably wouldn't be publicising my name and surname and twittering about it, if I really was trying to 'hide my origins'!! Anyway, I am not usually one for ranting - like I say, I don't think the negativity in the responses here is justified, and is certainly not a reflection of how people feel generally about the scheme! Note that Anonymous' Real Time Consultancy link is run by non-other than Phil Jones! The man at the centre of the climate emails. Or at least someone with the same name... coincidence? I think not. I think Anonymous #1 is right - clearly these 'bikes' (if they even exist) are just a communist plot to meddle with our modal share.